Melania Trump denounced the “oppression” of socialism and communism in a rare appearance in Miami during a President’s Day rally on 18 February. Her speech came as a total surprise amid ongoing tensions in Venezuela between President Nicolas Maduro and self-proclaimed interim leader Juan Guaido, who Mrs Trump, born in the then-Socialist Republic of Slovenia before it became independent in 1991, addressed at length. Melania's mouth says one thing, her eyes say another. There's no smile or concern in her eyes. And why is #Trump so worried about the dictator in Venezuela and not the one in North Korea who has nukes pointed at the U.S.A.? Switch and bait? — L.W. Samuelson (@benwar27) 19 февраля 2019 г. Another went further in his accusations of her hypocrisy, suggesting the rally at large was held in order to “distract” the general public from Donald Trump’s “criminal investigations”. Melania trump and her disgusting husband were in Miami today to pretend they care about the humanitarian crisis that’s happening in Venezuela just to distract from his criminal investigations. Nothing they do is because they care. It’s all sinister, I firmly believe that. — Ricky Davila (@TheRickyDavila) 19 февраля 2019 г. — Michael Tracey (@mtracey) 18 февраля 2019 г. Another twitterian even recalled Melania’s green jacket featuring what sounded like a slogan, “I really don’t care, do you?”, which she wore to one of Trump rallies earlier, prompting speculation, at the time, of the first couple being at odds and even filing for a divorce. “Even if you back regime change, casting Trump as a principled humanitarian is such a joke,“ another commenter stated, also questioning Trump’s “humanitarian” goals. — Diana Hester (@diana_hester) 18 февраля 2019 г.
Crisis-hit Venezuela has been witnessing large-scale controversy over the projected delivery of humanitarian aid into the country, which the opposition vehemently insistent on allowing it in. 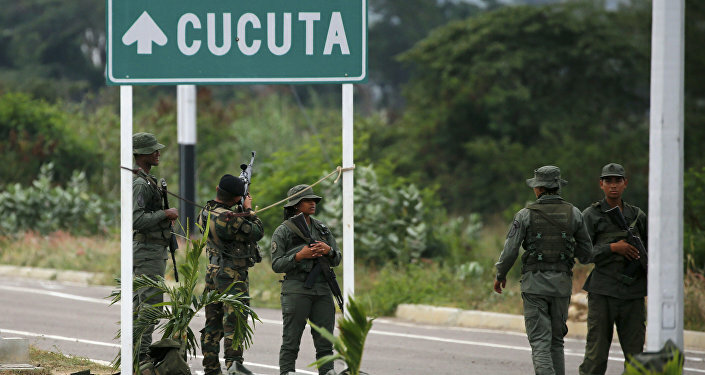 Venezuelan opposition leader Juan Guaido said on 17 February that the first batch – three US Air Force planes carrying humanitarian cargo for Venezuela – arrived in the Colombian border city of Cucuta. Meanwhile, there has been speculation of a potential US military intervention in Venezuela after President Donald Trump told CBS in a 2 February interview that such a course of actions was "an option." However, Congress has completely ruled this out, House of Representatives' Foreign Affairs Committee Chairman Eliot Engel said during a hearing on the Venezuelan crisis on Wednesday. Tensions in Venezuela escalated on 23 January, when parliamentary speaker Juan Guaido declared himself interim president, rejecting Maduro's re-election in May 2018. Guaido was swiftly recognised by the United States and a number of Latin American and European states. Russia, China, Turkey and Mexico are among the nations that reaffirmed their support for Maduro as the country's legitimate leader.